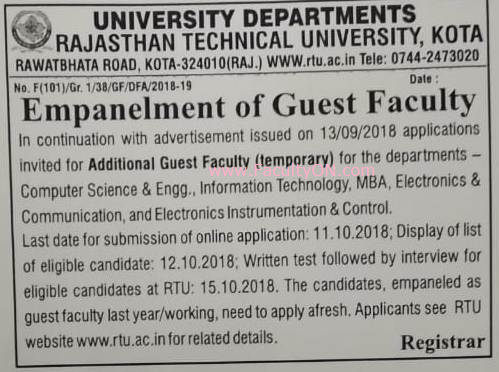 Rajasthan Technical University, Kota has advertised for recruitment of Guest Faculty jobs vacancies. Interested and eligible job aspirants are requested to apply on or before 11th October 2018. Check out further more details below. About University: Rajasthan Technical University (RTU) is located in Kota in the state of Rajasthan. It was established in 2006 by the Government of Rajasthan to enhance the technical education in the state. The university has been established in the campus of University College of Engineering, Kota (previously known as Engineering College, Kota), which is located on the Rawatbhata Road, about 14 kms from Kota Railway Station and 10 kms from Kota Bus Stand. Note: Those who were empaneled as guest faculty last year / working, need to apply afresh.